Vol.62　What Picture books are suitable for lessons with BLUE textbook? Vol.61 What picture books are suitable for lessons with YELLOW textbook? Vol. 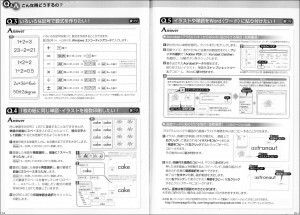 60 Is YELLOW textbook too easy for 1st grade Elementary school student? 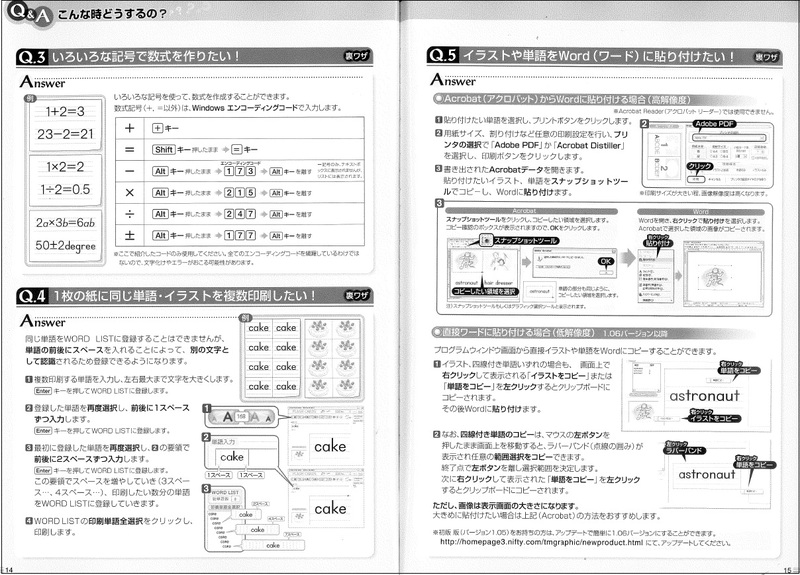 Vol.59　Can you print “Lined Worksheet Wizard” in black and white setting and print the words in light gray? 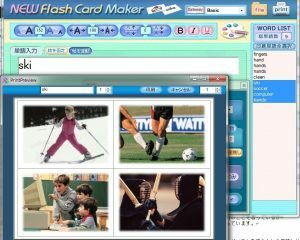 Vol.58　Can I import pictures into New Flash Card Maker? Vol.57　Do you have other materials that includes “*** stories” and “stroke orders” which is in the notebook (8-lines)? Vol.56　What is the difference between 1st edition of Tomorrow and Book5 TOMORROW(2nd edition)? Vol.55 Can you recommend some plays, skits and songs for grade 1-3 Elementary students (at beginners level)? Vol.54 Are there any textbooks suitable for 2 and 3 years old? What's the length of Picture book DVD and consists of how many chapters? Vol.53　YELLOW and BLUE are composed of songs and chants, they seem like a short course. Vol. 51 Activity area on the right hand side of Learning World takes a long time to see the result. What picture books are suitable for lessons with BLUE textbook? The following table shows the same categories as each unit in BLUE and picture books. Unit 5 Family Where is Everyone? Unit 6 Food What’s in the Cart? ＊There are no animals in the”Me Myself” picture book but the “A Happy Cat Song” in the unit contains adjectives (happy, sad, angry, scared). “Me Myself” picture book allows students to review the various adjectives. What picture books are suitable for lessons with YELLOW textbook? Unit 3 Family Where is Everyone? Unit 8 Food What’s in the Cart? Students learn basic vocabulary and phrases with pretty designs in the picture books and they get use to what they learned with catchy chants and songs. All the picture books come with an Audio CD. There are workbooks available also! Our picture books are popular for recitals! I am looking for a suitable textbook for students who are in the 1st grade at elementary school. Considering between YELLOW, BLUE or Book 1. For beginners in 1st grade elementary school students, we recommend WELCOME YELLOW. Topics like Alphabet, family, numbers, food and body parts are included in YELLOW and they can learn basic vocabulary. Songs and chants will allow students to learn basic vocabulary efficiently in a fun way. Book 1 is made for students who have learned approximately 400 words in their previous studying years (266 words in YELLOW, 315 in BLUE) and is recommended for those who have experienced the basics to start learning in earnest. There are also pages that students can try to figure what they are interested, or discuss about their own opinion in Book 1. 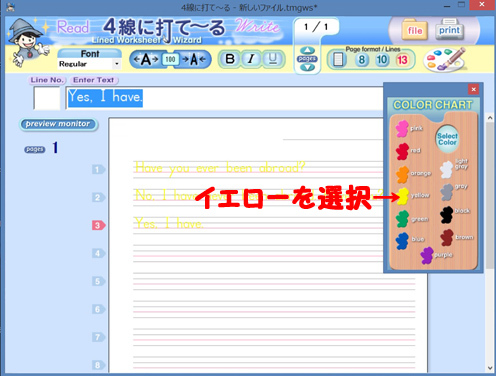 To pick one from PINK or YELLOW or BLUE, YELLOW which includes basic words and conversation, will be the most efficient choice to start studying with Book 1. The following steps of skipping BLUE after YELLOW are suggested depending on the students level. BLUE can be an option instead of YELLOW. These two books contain similar vocabulary and sentences. Students can learn more by using YELLOW as a basis and teachers add songs and chants from BLUE to their lessons. For example : Use songs and chants from Unit 6 – Food (BLUE) in a lesson of Unit 8 – Food (YELLOW). Learning words and dialog through activities with songs and chants will help students to remember English easily, and it also helps their future studies after Book 1. Each printer has different concentration but some printers automatically print gray dots darker. Choose yellow then print it in black and white. Yellow makes the printing color lighter when you print in black and white setting. This is recommended for students to trace. Not all words have pictures in the internal dictionary of New Flash Card Maker. Is it possible to import some pictures from my computer? If it is please explain how-to. For example it is not handy not to have pictures of hand, photo, what, think, this, that, he, she etc. Importing pictures is not supported but for those words without illustration can be pasted to Word data by copying the words. When you are making cards, you can fix the picture and edit the words then you can use the existing pictures for other words. *To create an image of “hand” (when you need only a picture of one hand): you can use the picture from “fingers”. “hand” does not contains a picture but type “fingers” and [fix the image] then change the word to “a hand”. Or pictures of “hands” or “clean” are picture of both hands, you can circle one of the hand and use it as a picture of “a hand”. *To create an image of “photo” : use pictures from “ski, soccer, computer etc” and [fix the image] , then change the word into “photo”. After installing NEW FCM, there will be a shortcut to a PDF of NEW FCM Manuals on your desktop. The Manuals has a list of all images at the end so you can check all the pictures. Make a word with NEW FCM and paste it to Word. Also paste the image of your choice there.